John Klofas, Bruce Smith and Josh Owen are being honored as RIT's first class of Distinguished Faculty. 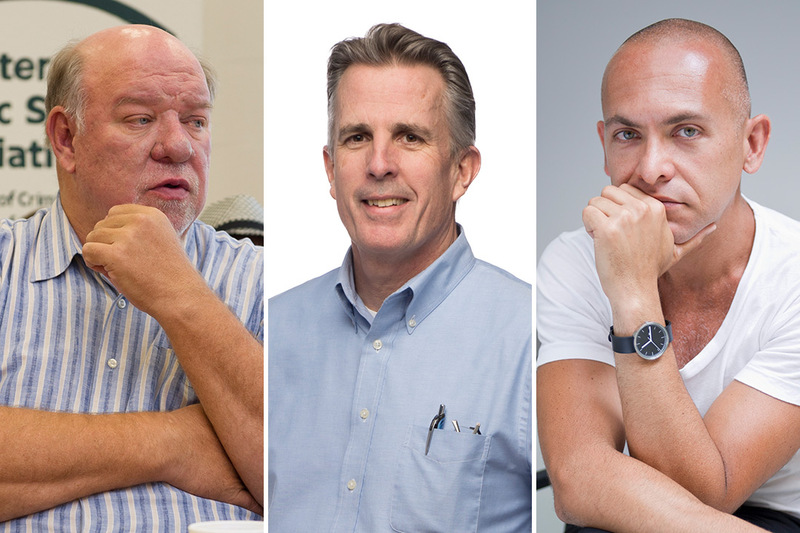 Rochester Institute of Technology announced its first class of Distinguished Faculty, leaders who have provided insights and solutions to today’s criminal justice issues, produced groundbreaking work in nanolithography and developed exciting industrial design innovations. Each has made his mark on campus, through scholarly work and mentoring students toward careers, and they have become recognized for their innovations among their respective academic, law enforcement and design communities. All three will be honored during the annual Celebration of Teaching and Scholarship at 4:30 p.m. on Tuesday, April 16, in RIT’s Ingle Auditorium. The Distinguished Professor designation is given to tenured faculty who have shown continued excellence over their careers in teaching, scholarly contributions, lasting contributions in creative and professional work and service to the university and community. About John Klofas: Founder and director of the Center for Public Safety Initiatives, Klofas developed and leads an important collaboration between RIT’s Department of Criminal Justice, the City of Rochester and criminal justice agencies of Greater Rochester including the Rochester Police Department and Monroe County Crime Lab. He and the team contribute to criminal justice strategy through research, policy analysis and evaluation. Its educational goals include training graduate and undergraduate students in strategic planning and policy analysis. His current areas of focus include community-level crime and justice issues including violence, management in criminal justice and strategies and practices in policing. His most recent book collaboration is an examination of changes in criminal justice at the community level titled The New Criminal Justice. Klofas continues as a research partner with local criminal justice agencies, on the state’s police training commission and on several national projects addressing community violence. About Bruce Smith: Ground-breaking work in nanolithography, first implemented more than 15 years ago by Smith, remain an industry standard in how semiconductor devices are manufactured today. He has more than 30 U.S. and international patents, and the foundational technologies he’s developed are the essential building blocks for electronic devices today. Through innovation in new imaging methods and processes, Smith and his students have been instrumental in the advances in integrated circuit lithography. His many patents in optics, masking and materials have been licensed worldwide. Among his many awards and recognitions, Smith is also one of RIT’s most distinguished alumni, who continues advances in semiconductor nanolithography using methods he and his team introduced pushing the resolution limits that are integral to today’s integrated circuits industry. About Josh Owen: Internationally renowned industrial designer, author and faculty-researcher, Owen is the director of the industrial design program at RIT. He is also the president of his eponymous design studio, Josh Owen LLC. His professional projects are produced by major manufacturers and have won many awards. His works are included in the permanent design collections of the Centre Georges Pompidou, the Corning Museum of Glass, the Denver Art Museum, the Philadelphia Museum of Art, the Musee des beaux-arts de Montreal, the Chicago Athenaeum and the Museum of American Jewish History. His students’ works have won awards, been exhibited and featured in international publications and critical venues and have been put into mass production prior to graduation. Owen’s professional work has been featured in major exhibitions, numerous books on design and is regularly included in critical design discourse. He is the author of the book Lenses for Design and the forthcoming Design for Study.